A limited edition 10th anniversary box set of the GOJIRA album From Mars To Sirius will be released by Listenable Records on February 12th. Exclusive cassette of From Mars To Sirius, only available in this box. 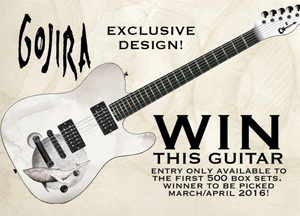 The first 500 buyers will get a postcard to enter a contest to win an exclusive Jackson guitar displaying From Mars To Sirius artwork all over its body. Pre-orders are available from Listenable's webshop right HERE.